This Page just shows how much fun I am having. 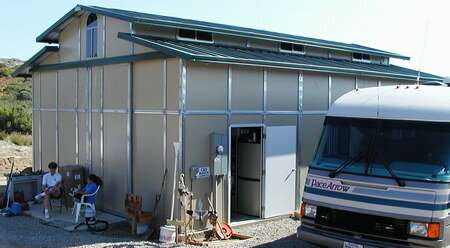 Back in 2001 when we were building the house we lived in the motorhome and barn for 6 months. 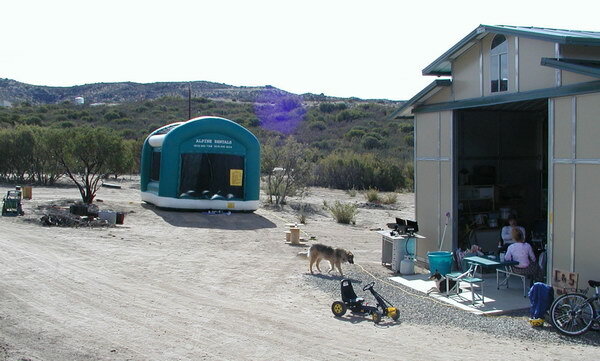 As Sandi and I are both pack rats, which is interesting as some of the residents of our area are kangaroo rats, we needed a 940sq foot barn to hold all the junk we could not get into our 1800sq foot house. It even makes a great place for a kids BD party. Found an HP counter at Yuma to use with my GPS frequency standard. Kenwood 440S from a Ham in Florida. Second and third shelf's are GE MVS VHF radios. One for fire and 1 for Ham + RS Digital Scaner. July 2016. Added a Swan 1200x linear amp, Astron PS, and Kenwood 280 VHF fire radio. More punch in the barn. 100AH AGM battery on the floor for emergency power. Antenna tree for VHF and up. Top VHF for Ham. The white dome is the GPS antenna for the Motorola frequency standard. Below VHF for the fire radio and antenna for the scanner. Just above the bracket a 900 MHz yaggi for regional trunking LE and fire. On very nice aluminum poles W1Wy gave me. July 2016. Upgraded Barn antenna away from the metal barn. 80/40 Meter OCF Carolina Windom Fan Dipole. Works 80, 40, 60, 20, 17 through 10 Meters.